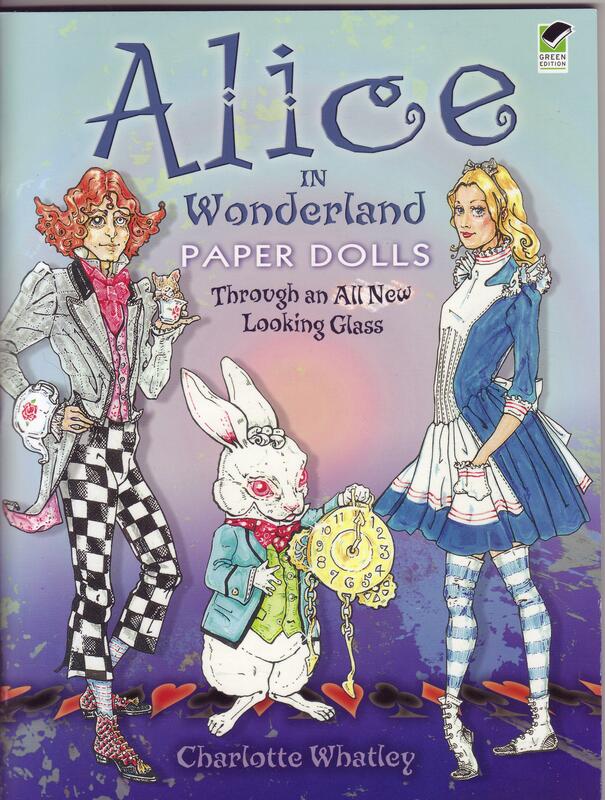 Alice in Wonderland Paper Dolls: Through an All New Looking Glass by Charlotte Whatley. Published by Dover, 2010. Paperback, first edition. Prepare to fall down the rabbit hole and plunge through the looking glass again — Alice is getting edgy with this modern paper-doll interpretation. Replete with stunningly original costumes and accessories, these 16 dolls crackle with steampunk style, a creative combination of science fiction, fantasy, and Victorian-and Edwardian-era fashions. This vibrant re-imagining will appeal to paper-doll enthusiasts of all ages. Alice in Acidland: Lewis Carroll Revisited by Carroll and Thomas Fensch. Published by A.S. Barnes and Co/ T.Yoseloff, 1970. Hardback first edition. …Charles Dodgson may have passed Thomas DeQuincey on the streets of London — after all — this was generally the same era that DeQuincey wrote Confessions of an English Opium Eater. Originally published in 1970, Alice in Acidland suggests that Alice’s experiences – -and the curiouser and curiouser animals that she encounters — echo the LSD trips of the hippie 1960s – -and could easily have been visualized by Thomas DeQuincey and the mad hatters of Lewis Carroll’s time. It’s basically the original book with drug-themed annotations: quite fun. Lewis Carroll in Numberland: His Fantastical Mathematical Logical Life by Robin Wilson. Robin Wilson (born December 1943) is a Visiting Emeritus Professor in Pure Mathematics at the Open University, a Stipendiary Lecturer at Pembroke College, Oxford and professor of geometry at Gresham College. In Graph Theory my main interests are in colouring problems – especially in edge–colourings of graphs and the four–colour problem. In the history of mathematics, I am interested in British mathematics – especially the 17th century and the period 1860 – 1940 and in the history of graph theory and combinatorics. He’s apparently the son of Harold Wilson, former Prime Minister. Lewis Carroll’s writings have inspired and entertained generations of readers, but now his forgotten achievements in the world of numbers are finally brought to light by highly acclaimed author and mathematician Robin Wilson. Here Wilson explores the singular imagination of Charles Lutwidge Dodgson – known to millions around the world as Lewis Carroll – the creator of “Alice’s Adventures in Wonderland” and “Through the Looking-Glass”. 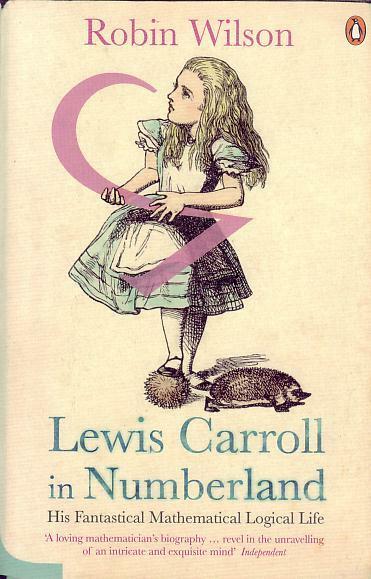 “Lewis Carroll in Numberland” shows how this incredible mind was not limited to the exuberant fantasy and word play of his children’s books which brim with mathematical allusions – arithmetical, geometrical, logical and mechanical. Dodgson’s exceptional talent as a mathematician won him the Christ Church Mathematical Lectureship at Oxford, a position he held for over twenty-six years. During this time he published extensively and brilliantly in the traditional fields of geometry, logic and algebra. Wilson’s passionate celebration of Dodgson’s mathematical achievements reveals that his work in numbers went far beyond the purely academic. We are taken inside the mind of a man who turned his mathematical genius to the study of voting patterns, to the design of tennis tournaments and even to the prolific creation and popularization of imaginative, numerical puzzles. This absorbing book introduces us to the mind behind the myth and shows the true range of Carroll’s extraordinary talents and numerous contributions to British society. 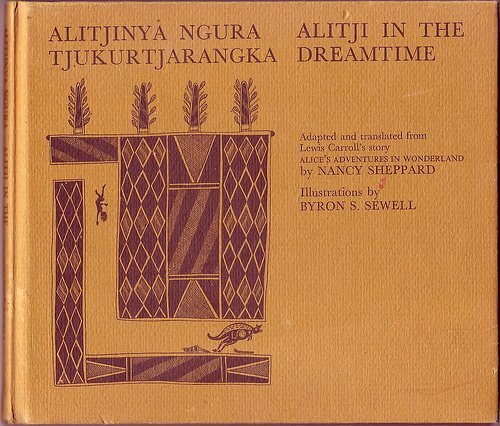 Alitji in the Dreamtime: a re-telling of Lewis Carroll’s Alice in Wonderland story by Nancy Sheppard using Australian Aborigine language and imagery: the white rabbit has become a kangaroo and the dormouse is now a koala. The story is told in the Pitjantjatjara language of Central Australia ( http://en.wikipedia.org/wiki/Pitjantjatjara) and is back-translated into English alongside. The illustrations by Byron Sewell are rather beautifully printed in brown ink: far more elegant than black, especially on the grey-brown of the paper. I think this is one of my favourite alternative Alice stories: the tale is well told, the rhymes and verses stand up well and the illustrations are beautiful. It works well as a book on its own merits, and it adds dimensions to the original story. Recommended. 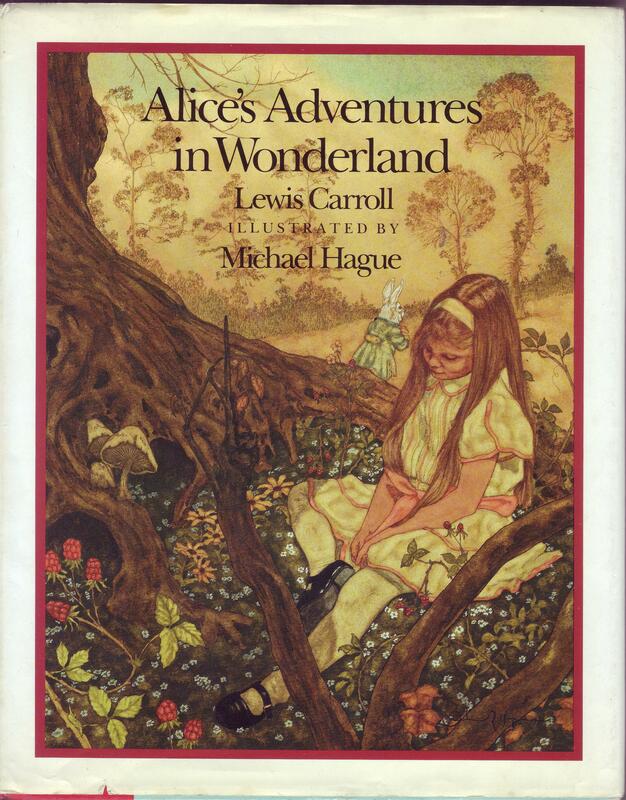 Alice’s Adventures in Wonderland: Lewis Carroll, illustrated by Michael Hague. Published by Methuen Children’s Books, London. 1985. I count myself as one of the most fortunate of beings. For as an artist I have not only the pleasure but the duty to daydream. It is part of my work. I have been a contented day dreamer all of my life, often to the exasperation of those around me. I have always wanted to be a book illustrator. Books are what got me interested in the art field in the first place. I try to infuse my illustrations with the same spirit that the author or the story produced in my imagination. I strive to create something from an empty canvas that becomes a whole ‘other world’ that people can visit for a while and totally believe in. That challenge of bringing a subject to life and making it believable – and that’s what is exciting to me as an artist. It doesn’t matter whether it is a Greek myth or an American legend, my approach is the same, to try and blend fantasy with realism. You can see a couple of the illustrations here. 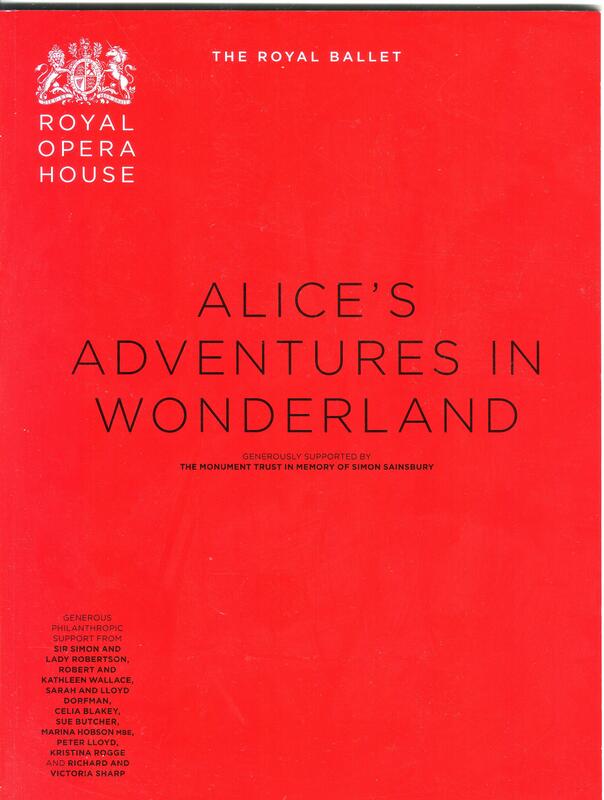 Royal Ballet Programme: Alice’s Adventures in Wonderland, with cast list for 15th March 2011. The first new, full-length ballet score for The Royal Ballet for 20 years: music by Joby Talbot and choreography by Christopher Wheeldon. …they began running when they liked, and left off when they liked, so that it was not easy to know when the race was over. However, when they had been running half an hour or so, and were quite dry again, the Dodo suddenly called out The race is over! and they all crowded round it, panting, and asking, But who has won?